Illinois National Guardsman and taxidermist Justin Lutz has undertaken a unique project: Restoration of a famous WWI mascot named Goldberg. The book Illinois in the World War tells the story of the regiment, who served originally as the First Cavalry of the Illinois National Guard. Eager to join the battle overseas, Colonel Milton J. Foreman reorganized his group in July 1917 and instituted the necessary training at the Chicago armory to prepare the men for the front lines. Before the newly created 122nd Field Artillery was deployed to France in May 1918, a soldier named Jake O’Connor of Battery B came into possession of a two-week old Irish Terrier. The men adopted the dog and named him Goldberg after a Chicago shoe store called O’Connor & Goldberg. They fashioned a khaki service cape for him complete with chevrons, and smuggled him off to war. While accompanying the men on the battlefront, Goldberg was gassed in the fierce Meuse-Argonne Offensive and took shrapnel. Goldberg was even lost for a month, having ran ahead of the 122nd. While returning home, papers reported that Goldberg fell down a hatch on the ship and broke a leg. Goldberg was sold to a man named Joseph Bach, who bought the dog for his son. 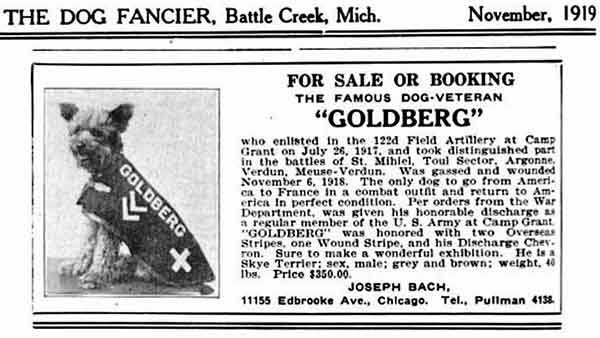 But a few months later, he began advertising Goldberg for sale or booking as “the famous dog-veteran.” In 1929 the Associated Press reported that the then 13-year-old dog would stand at attention when the Star Spangled Banner was played, and would cry when he heard war song on the radio. 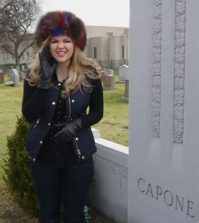 By 1932, Goldberg had been claimed by a man named William McKleghan, a member of Battery B. In August of that year the village council of Wilmette voted to grant Goldberg a lifetime dog license. 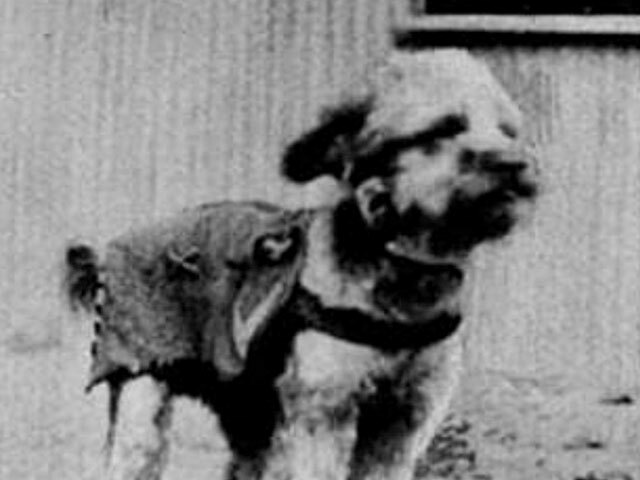 He was believed to be the last living dog mascot from the war. Goldberg died in 1933 at the age of 16. Rather than be buried in the plot set aside for him by the Illinois Pet Memorial Cemetery in Hinsdale, Battery B decided to have him stuffed. 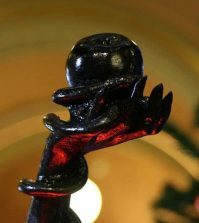 spent the next 60 years in a glass case in the main lobby of the armory on Chicago Avenue and attended every reunion of Battery B until as late as 1967. When the armory was closed in 1993, Goldberg vanished. He was later found in storage and given a new home in the WWI trench/bunker exhibit of the Illinois State Military Museum in Springfield. After so many years, though, Goldberg was in desperately need of repairs. Lutz told WAND that he hopes to have the project done by December. Thanks to Pamela Bannos for her great compilation of articles and information on Goldberg right here.